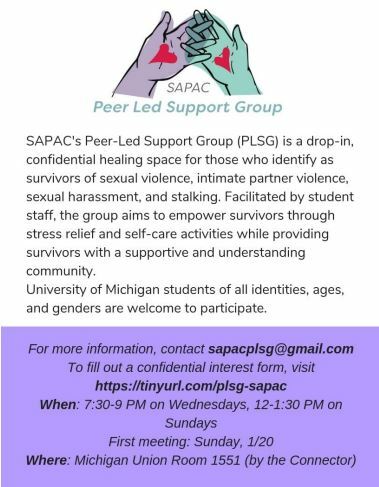 SAPAC's Peer-led Support Group is a weekly, drop-in, confidential healing space for UM students who identify as survivors of sexual violence, intimate partner violence, sexual harassment, or stalking. The group aims to empower survivors and facilitate resilience, reconnection, stress relief, and anxiety reduction for our participants. We’ll be doing this through semi-structured activities, self-care practices, creative arts, and creating a safe space for sharing if participants choose to do so.  Overall, we want to provide a supportive, understanding community that welcomes UM student survivors of all ages, genders, and identities. SAPAC's Peer-led Support Group is a weekly, drop-in and confidential group for survivors to express concerns and find support among peers in a comfortable setting facilitated by student staff. The group offers semi-structured activities, self-care practices and safe space for sharing if individuals choose to do so and is open to all survivors of sexual assault, intimate partner violence, sexual harassment, and stalking. University of Michigan students of all identities, ages, and genders are welcome to participate, as long as they are University of Michigan students.